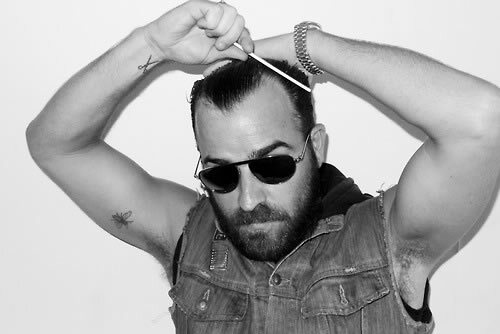 Justin Paul Theroux by professional is an American actor also director as well screenwriter was born on 10th August, 1971 in Washington D.C., United State. His father Eugene Theroux worked as a corporate lawyer and mother Phyllis worked as Author and Journalist in The Washington Post. Justin attended school Lafayette Elementary for K-6 and then till 7th grade went to the Annunciation school. After 7th grade he was been transferred to began acting training from Buxton School and then he continued from his 8th grade in The Field school. He then graduated B.A in 1993 in visual Arts-Drama from the Bennington College. Justin was really interested in tattoos. He wanted to show his feelings through his tattoos. For example, once he had a chest tattoo having a beautiful heart drawn on it. And once he got his back filled with a large tattoo designed by Scott Campbell. In both cases he wanted to show his feelings more than just showing off his style. The bee tattoo looked amazing when he had it on his right shoulder. Though it was hard to find out the meaning behind that tattoo but it looked amazing. According to Justin, the tattoos are all riddled as well ruined for him to really mention about and most been ruining by the tattoo artist Scott Campbell which is not at all regrettable for him.